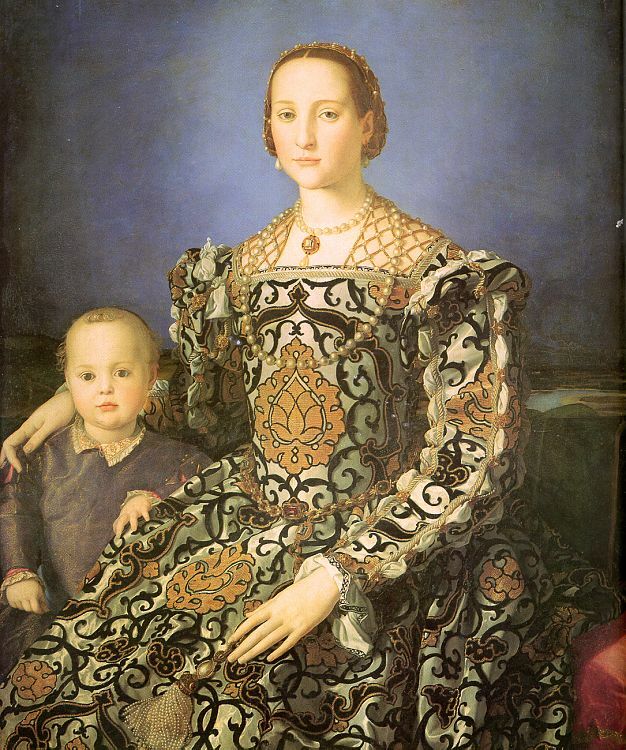 Like sooo many others before me, I've loved the "Eleanor of Toledo with Son" portrait painted by Bronzino. Something about it is so striking that I keep coming back to the painting again and again. I've always enjoyed the lighting of the picture, the colours used, and the freshness of the faces of the couple. With the uncluttered look of the painting and clearness of the details of the painting, I always felt Bronzino really captured the elegant-ness of Eleanor and her Son. In order to answer some design questions seen in the painting, I needed to do some background research on both the sitter (Eleonora) and the painter (Bronzino). This proved to be more difficult than at first thought. Eleonora had been born in Spain, raised in Naples, and married off to Florence. Bronzino, on the other hand, was known as a portrait painter, he had not accomplished a lot of other types of paintings, there by making it difficult to compare his interpretations. It also didn't help that Eleonora's name could be spelt in 4 or 5 different languages (making searches for her difficult), and Bronzino went by 2 different names, causing many people to confuse his name with other artists. Based on available evidence, and conjecture, I have attempted to recreate the Eleonora gown as close as possible. Below is a list of all the elements of this gown. I've started off with a conjecture of her fabric, because it does seem to affect the layout and placement of the pattern pieces. I moved on to the different clothing pieces, and finally the finished gown on a real person. You can move onto the next section at any time by using the links found at the top and bottom of every page, or use your browser's back button to return to this page.